A growing number of people on social media are calling for the removal of Communist dictator Vladimir Lenin’s statue in Seattle. Many social media users, from a prominent Seattle venture capitalist to the estimated 900 people who follow the Facebook group Seattle, Tear Down This Lenin Statue! are calling for Lenin’s statue to be removed. Some people defended the statue’s presence in Fremont. The calls for the statue’s removal come after protesters pulled down a Confederate statue in Durham, North Carolina, Monday and city officials in Baltimore, Maryland, removed four Confederate statues. 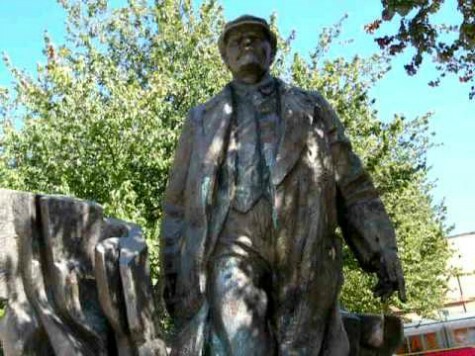 The Seattle Times reports that the Lenin statue was installed in the Fremont neighborhood of Seattle in the early 1990s as a public art display after a Seattle man purchased the 16-foot statue following the fall of the Soviet Union. Those who went against communism during Lenin’s reign were subject to arrest, persecution, violence, intimidation, and execution. More than 90 million innocent people died under Lenin’s watch, including Roman Catholic priests and others who dared to go against Bolshevik thought. The meaning behind the statue has caused a stir on Reddit, where people commenting on the “the donald” subreddit say that liberals are hypocrites for allowing a statue of someone responsible for the murder of millions of innocents to stand while calling for the removal of Confederate statues. The town, however, does not look like it plans to destroy the statue anytime soon. The Fremont neighborhood website states that the art installation “outlasts politics” and represents 20 years of controversy.